Not one to let the earth's rotation get in the way of a good lunar eclipse, Google will offer several ways to watch today's total lunar eclipse live over the Internet. The earth will shield the sun's rays from the moon starting at 11:20 a.m. Pacific time on Wednesday. The total lunar eclipse will be visible from Australia, Asia, Africa, Europe and South America, meaning that folks in North America won't get to see the eclipse first-hand -- including Google. The search giant is partnering with Slooh Space Camera to help everyone catch a glimpse. The simplest way to watch the eclipse is to visit YouTube's Google channel, which will host a live feed later today. For a more elaborate set-up, check out Slooh's mission interface powered by Google Apps. It allows you to see images of the eclipse from multiple angles and listen to audio narrations, and Slooh members will be able to take high-resolution screenshots. Android phone owners can download Slooh's Space Camera app, which offers a similar experience to the desktop mission interface. Google has used the moon to showcase the company's service before. In 2009, Google added a complete map of the moon to Google Earth, and last year Google Earth hosted live camera images from Slooh during another total lunar eclipse. 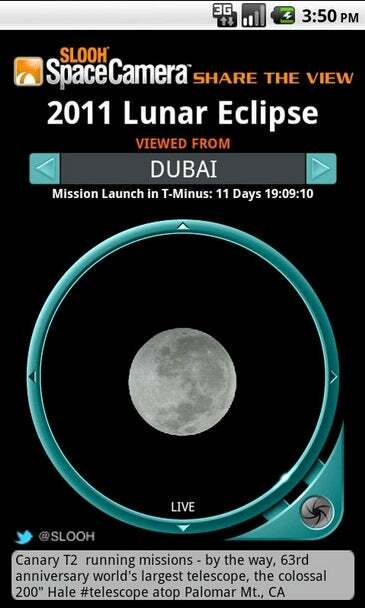 This is the first time an Android app has been available for the occasion, and it will also be the first eclipse live feed on YouTube. But Google's fascination with space isn't always tied to a specific product. In 2007, the company pledged $30 million to anyone who could land a private spacecraft on the moon. The prize remains unclaimed.